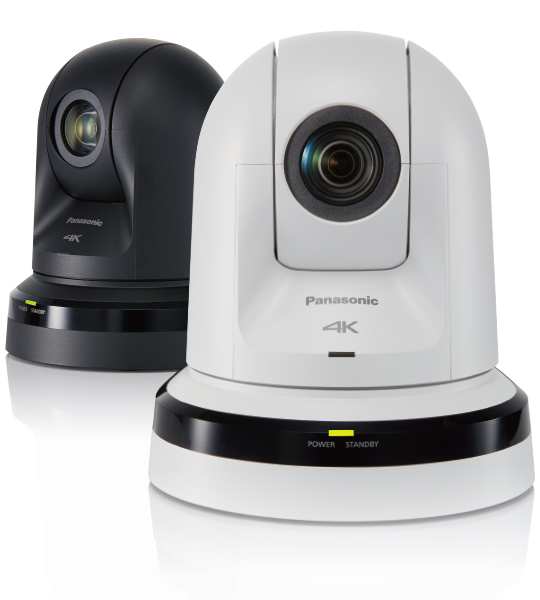 The compact AW-UE70W/K integrated pan-tilt remote camera can output 4K video via HDMI, USB and IP transmission. By introducing technological capabilities developed in our 4K cameras for movie production and TV station use, we created the AW-UE70W/K as a 4K integrated camera that can be effectively used in a variety of environments. It achieves 4K shooting in situations where higher image quality is necessary, such as lecture recordings and conference, wedding and funeral hall content production. With the four-drive lens system, three zoom lenses and one focus lens are driven independently and simultaneously. Since the four groups of lenses can be driven separately, we were able to efficiently minimize the size and drive range of each lens and thereby achieve a smaller body and a zoom mechanism with high magnification and high image quality. Despite its compact size, the AW-UE70W/K has a high-resolution 20x optical zoom and a high-performance iA 22x zoom (4K mode). Four types of output connectors. 4K output via HDMI, USB and LAN. 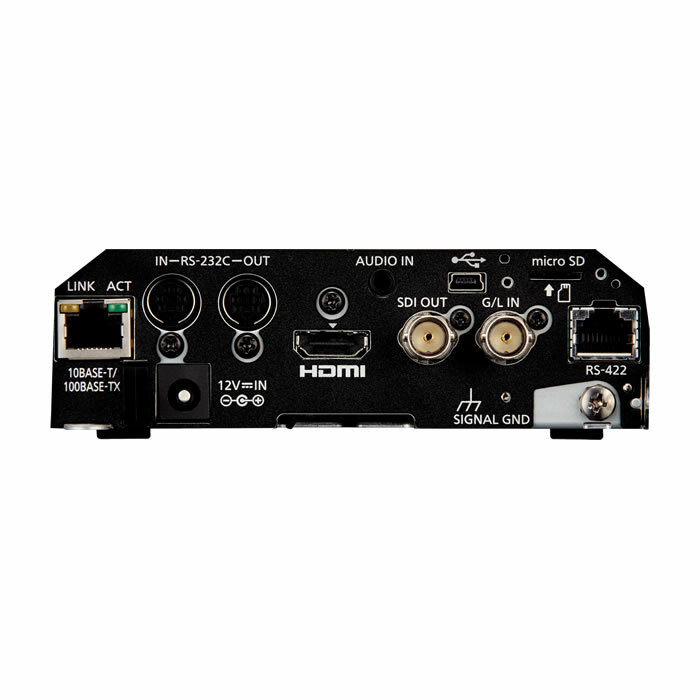 On the back of the unit, there are four types of output connectors which are HDMI, SDI, USB and LAN. 4K video output can be done not only via HDMI, but also via USB and LAN. This makes it possible to build a flexible system matching the specific objectives and environment. *1: Depending on the output mode, certain restrictions apply. *2: Settable when HDR is “Off”. *3: Settable when HDR is set to “Off” and the frame rate is other than 60fps (or 50fps). *4: Not settable when HDR is “Off”. Equipped with a 1/2.3-type MOS sensor and DSP (Digital Signal Processor) for high sensitivity and high resolution. 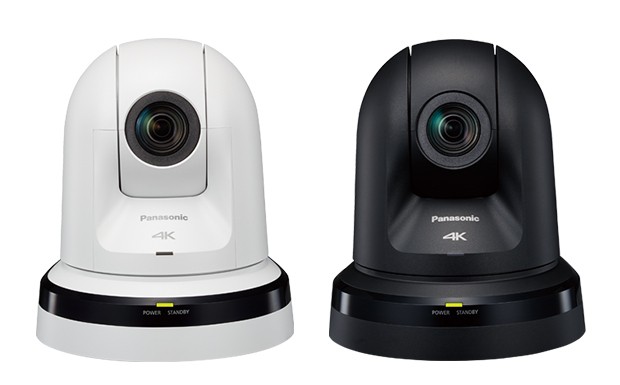 In addition to a 20x optical zoom, the AW-UE70W/K series can zoom up to 30x (22x when in 4K mode) while maintaining high resolution thanks to Super Resolution technology. It also features a 12x digital zoom*5 and a 1.4x, 2.0x, 4.0x, 6.0x, and 8.0x digital extender zoom which can be used for 4K focus assist. 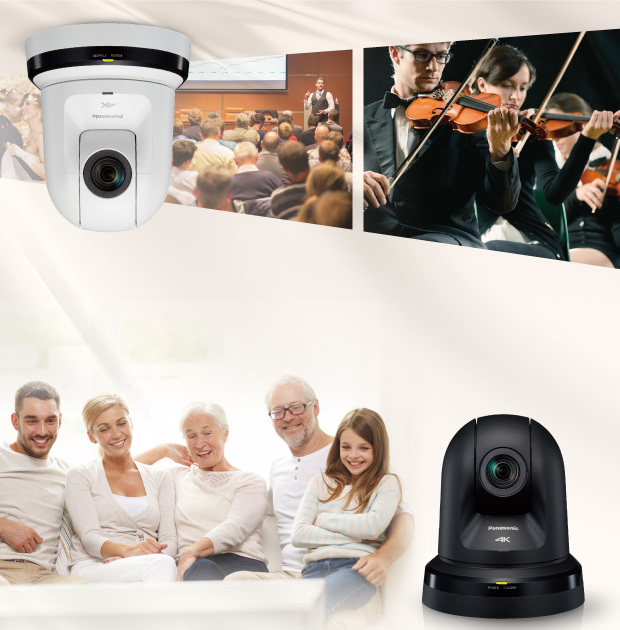 These capabilities enable the AW-UE70W/K series to shoot in large conference halls and classrooms. *5: Picture quality is lower with the digital zoom. In addition to conventional Dynamic Range Stretch (DRS) and Digital Noise Reduction (DNR), the AW-UE70W/K is equipped with High Dynamic Range (HDR) mode. When shooting and synthesizing two images with differing exposure times, the AW-UE70W/K can create video with high visibility that corrects for halation and black defects even under backlit conditions. *6: Cannot be used when in 4K mode. Image shake is reduced with both optical and digital 4-axis automatic stabilization that detects mounting surface vibration caused by audio equipment and opening/closing doors. The Freeze During Preset function enables to freeze the video during preset playback. The immediately preceding still image is output during preset movements so that the swiveling movement is not displayed, making operations possible with one camera. Equipped with a JPEG Image Saving function that enables camera video to be saved, played back and deleted on a microSD card as still JPEG images. * Use may require a software version update.